….and in no time, room was full! Excitement was set to start at 10:30 AM and first session was started as per schedule and delivered by Vinod (B|T). His topic was “Tour of PowerPivot with Excel” and he continued with his last session’s excel trick about FlashFill feature of excel 2013. Well received session and ended with claps of 70+ folks. 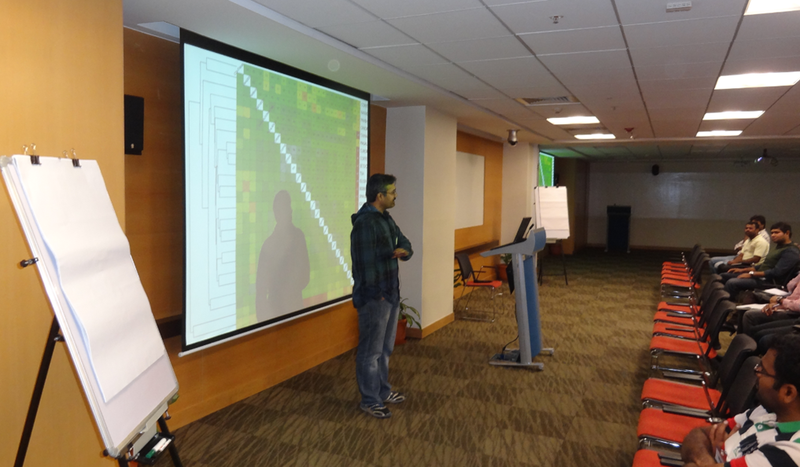 Next session taken by S Anand (B|T) on “Advanced Excel Visualizations”, who showed is the real power of visualization. He demonstrated analysis done for various classes results, hotel eating pattern, child birth pattern. In below picture, he was explaining why some hotels replaced their 1 liters bottle to 200 milliliters bottle. This session was truly an eye opener and shown that how easy it is to read the data if its presented properly. This was truly one of the mostly discussed session after delivery. Later, Selva (Blog|FB) from SQL Server Escalation Services team, who was called as hidden Gem by Vinod. 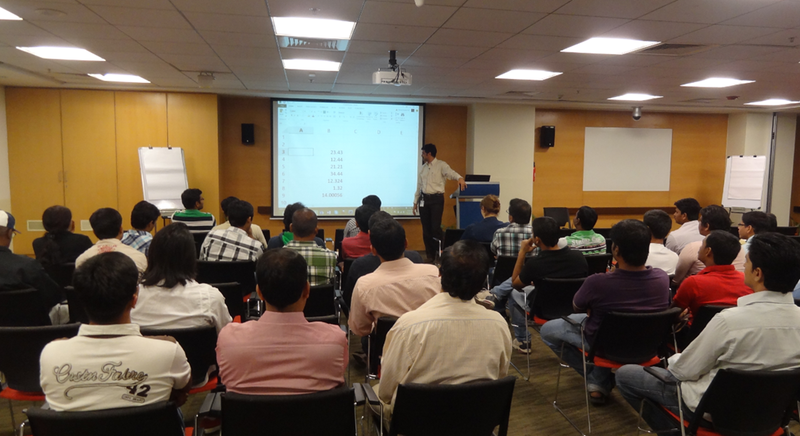 Session title for Selva was – Introduction to PowerView with Excel. 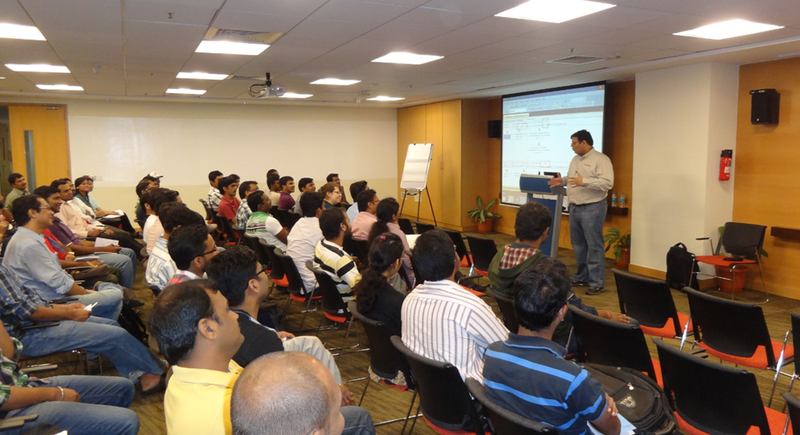 It was truly amazing session and was a good start point for them who wanted to learn PowerView. As per his demo “we might overtake china in population in next few years”. Sorry Selva, no picture. Finally, most awaited surprise session from Pinal Dave (b|t) started and in a short session of 15 minutes, people learned about Auto Update Statistics and Auto Create Statistics setting of a database. Pinal was missing the cameraman and suddenly god shown his grace and Manas (b|t), appeared and clicked some pictures. In his own unique style of presentation he showed one of the addictive game “Angry Bird” screenshot and asked which level it is. As usual there were many fun elements in the session and no one can forget those 15 minutes. One of the participants , Onkar, who kept him on toes received his famous book SQL Server Interview Questions and Answers (Amazon | Kindle | Flipkart | Indiaplaza) as a reward. Pinal also shared a secret that why he checks in to all new places via foursquare (don’t worry Pinal, I will not write here). Session was full of infotainment followed by closure picture. Below are those folks who stayed late to have a photo session. Few more folks were nice enough to take a picture with me as well I tried my best to hide my tummy by “cheese and inhale” trick but it didn’t work and got worst of my pic ever. That’s all for now. I personally had a great time in organizing, executing and becoming reporter of this event along with Vinod. Feeling free to join the excitement at Facebook. This is Balmukund, with no cameraman, reporting on wordpress about SQLBangUG#3.